OH MY GOD!!! Have been looking for this for years, had recorded it from radio and nobody could tell me what it was! THANKS!!! This looks ghetto fabulous... gonna have to check it out. Thanks for all the shares! 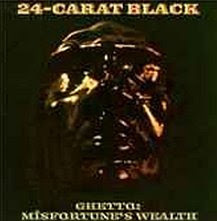 I had "Ghetto: Misfortune's Wealth" on a compilation record years back. I'm looking forward to listening to this album. This is an amazing record. Big ups for posting it, great find.